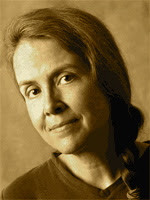 A Year of Being Here: Naomi Shihab Nye: "Breaking the Fast"
"Breaking the Fast" by Naomi Shihab Nye, from Red Suitcase. © BOA Editions, 1994. Image credit: "Waking Up," acrylic on canvas, by Douglas Simonson (originally color). What a beautiful poem, with a beautiful tight structure, and the aquatic imagery works incredibly well!